Scearp Digital (‘SD’) believes that privacy is important to the success and use of the Internet. 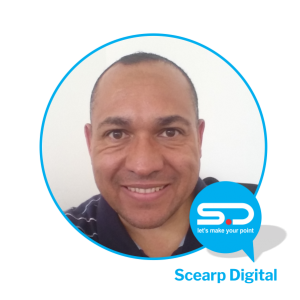 This statement sets forth the ‘SD’ Privacy Statement for www.scearpdigital.co.za and describes the practices that ‘SD’ will follow with respect to the privacy of users of this site. From time to time, we may change this Privacy Statement. For example, as we update and improve our service, new features may require modifications to the Privacy Statement. Accordingly, please check back periodically. If you have voluntarily provided information, you consented to the collection and use of your personally identifiable information as described in this Privacy Statement. In some circumstances, ‘SD’ may share information you voluntarily provide us with trustworthy business partners. We do not sell or rent personal information collected through this site to anyone. Also, ‘SD’ may provide aggregate statistics about visitors to our sites, such as volume, traffic patterns, and related site information to reputable third-party vendors, but these statistics will include no personally identifiable information. ‘SD’ may also disclose information in special cases when we have a good faith belief that such action is necessary to: (a) conform to legal requirements or comply with legal process; (b) protect and defend our rights or property; (c) enforce the Web site Terms and Conditions of Use; or (d) act to protect the interests of our users or others. Some ‘SD’ sites, like many other commercial web sites, may utilize a standard technology called “cookies” to collect information about how our site is used. Cookies were designed to help a web site operator determine that a particular user had visited the site previously and thus save and remember any preferences that may have been set while the user was browsing the site. Cookies are small strings of text that web sites can send to your browser. Cookies cannot retrieve any other data from your hard drive or obtain your e-mail address. If you are simply browsing an ‘SD’ informational site, a cookie may be used to identify your browser as one that has visited the site before. If you are using an ‘SD’ web site for which you registered and chose a password, we recommend that you do not divulge your password to anyone. We will never ask you for your password in an unsolicited phone call or in an unsolicited e-mail. Also remember to sign out of the registered site and close your browser window when you have finished your work. This is to ensure that others cannot access your personal information and correspondence if others have access to your computer. ‘SD’ sites may contain links to other sites, including those of our business partners. While we seek to link only to sites that share our high standards and respect for privacy, we are not responsible for the privacy practices employed by other sites.